By Jesse E Brown, DVM , PhD. Well summertime is in full swing with it being June and approaching the longest day of the year and so are some of the seasonal maladies that affect our pet’s health and safety. Here at Animal Emergency of Gainesville we are seeing an increase in the number of emergency snakebite treatments which is expected for this time of year as snakes are very active now especially at night. It seems that the most common snakebite is from the Copperhead (Agkistrodon contortrix). Copperhead bites cause an immediate swelling of the area surrounding the bite and intense pain. The bite is characterized by one or more pinpoint puncture wounds that ooze a blood tinged fluid that varies in consistency. Typically any area that is affected by edema (swelling due to fluid accumulation) due to a snakebite is very painful to even the lightest touch. This is in contrast to allergic edema, which may be quite remarkable and incite intense itching, that is not painful. In Hall County and surrounding the surrounding counties your pet may also encounter the Timber Rattler (Crotalus horridus, AKA the Canebrake rattlesnake) or the Pigmy Rattler (Sistrurus miliarius). You can Google pictures of these for future reference. If your pet has an encounter with a venomous snake and it is bitten you should seek emergency veterinary advice ASAP. If you see the snake and can take a picture of it at a distance do so but don’t attempt to handle the snake. It helps to know what kind of snake is involved but it does not need to be brought in to us. The best treatment for the bite is antivenin as that is the only therapy that will inactivate the venom. 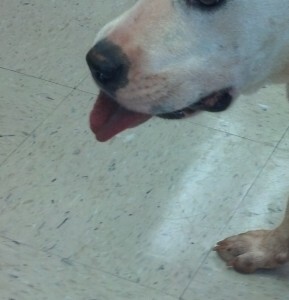 Shown in the pictures is a patient that was bitten on the tongue and treated here at Animal Emergency of Gainesville. 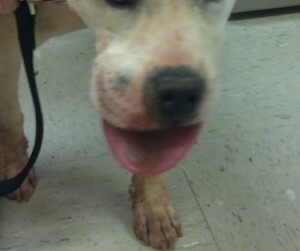 Note that the patient could not withdraw the tongue back into the mouth because it was so grossly swollen and painful. Antivenin was administered and within an hour the swelling was subsiding and the patient was able to go home and was much, much more comfortable. Venomous snakebites can be fatal with those of rattlesnakes being the most dangerous but with all of the venomous bites there is extreme swelling and pain and the venom can cause tissue to die and disfigure the patient. 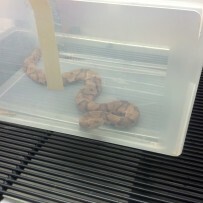 We keep antivenin in stock and are experienced with handling these snakebite emergencies. We are open all day & all night on every major holiday.